Chant is, of course, the best-known aspect of Buddhist music in the Western world. The perusal of any music store will reveal at least a dozen different CDs of chant, and particularly Tibetan Buddhist chant. In Tibetan monastic communities, learning to chant is so important and universal that it is the one thing that almost all the communities have in common; it is written explicitly into the constitution of nearly every monastery. Young monks have to take specific examinations on chant, and if they do not memorize or perform the chants correctly, they may be dismissed from the monastery. Instrumental music most often serves to demarcate aspects of Buddhist ritual. 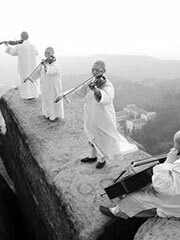 While Theravada Buddhism relies more on non-musical chant, Mahayana Buddhism uses a wide variety of wind as well as percussion instruments. These wind instruments include horns, double-reed oboe-type instruments, end-blown flutes, and conches. Honkyoku are the pieces of shakuhachi or hocchiku music played by wandering Japanese Zen monks called komuso. Komuso played honkyoku for enlightenment and alms as early as the 13th century. In the 18th century, a komuso named Kinko Kurosawa of the Fuke sect of Zen Buddhism was commissioned to travel throughout Japan and collect these musical pieces. The results of several years of travel and compilation were thirty-six pieces known as the Kinko-Ryu Honkyoku. Repetition of the name of Amitabha in Pure Land Buddhism. Shomyo in Japanese Tendai and Shingon Buddhism. Tibetan Buddhism is the most widespread religion in Tibet. Musical chanting, most often in Tibetan or Sanskrit, is an integral part of the religion. These chants are complex, often recitations of sacred texts or in celebration of various festivals. Yang chanting, performed without metrical timing, is accompanied by resonant drums and low, sustained syllables. Other styles include those unique to Tantric Buddhism, the classical, popular Gelugpa school, the romantic Nyingmapa and Sakyapa and Kagyupa. Shomyo (声明) is a style of Japanese Buddhist chant; mainly in the Tendai and Shingon sects. There are two styles: ryokyoku and rikkyoku, described as difficult and easy to remember, respectively.